With the present demonetization move by the Government, the much talked about industry today is real estate industry and the much talked topic is real estate prices. 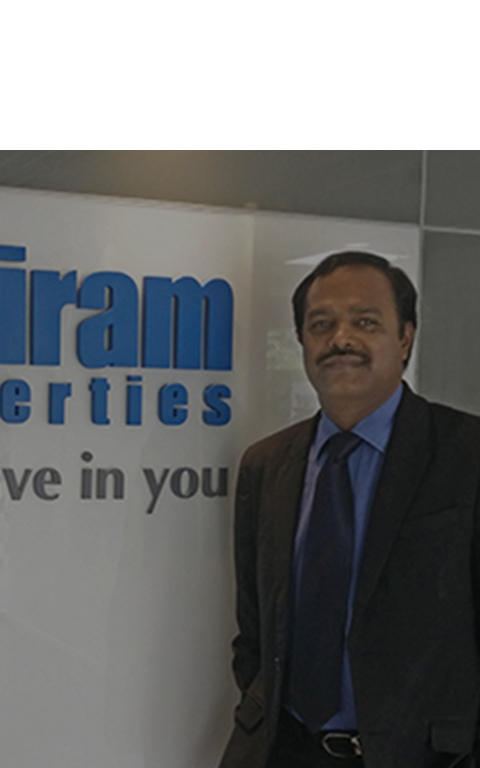 The advent of series of transformational reforms Viz.. Demonetization, Real estate regulator (RERA), GST, Benami Transactions (Prohibition) Amendment Act, IFRS , all in a row and in quick succession has created lot of ripples ,expectations and predictions about India’s real estate sector as to how it is going to react and respond in bringing home buyers confidence back into the markets . The housing segment of the Indian real estates can be broadly classified into three luxury or upper segment, mid segment and low end /affordable housing segments. To put it bluntly, Demonetization is not going to have much direct impact on mid market housing and affordable Housing segments. It may be relevant here to remember that the housing shortage in India is characterized by the fact that more than 90 percent of housing shortage (appxly 20 million units) relates to EWS/LIG Housing. The luxury real estate is less than 5% of the overall demand in almost all the cities. With demonetization, It is widely anticipated that land price will come down . Approximate estimations say, post demonetization, southern states may witness 20% fall in land prices while Mumbai and NCR may witness a fall of 30% and 50% respectively corroborated with the cash components involved in the transactions hitherto. But what shall be the impact of the fall in land prices on the real estate prices for affordable housing ? In an affordable housing apartment project with unit price at Rs 3000/ per square feet plus stamp duty and Registration fees, the fall in land prices by 20 percent to 30% will have only a negligible impact of say 2 % to 3 % on the overall price. In other words, a fall of less than Rs 100 per square feet will not alter the situation significantly. It is apprehended even Rs 100 will also be eaten away by unexplainable incidental expenses and uncertainties. But , there could be some impact on the land prices which may affect the luxury real estate market directly as the land cost is directly proportional to the end price of the unit / apartment / home . In other words , the estimated fall in land prices is not going to impact the mid income and affordable housing projects. 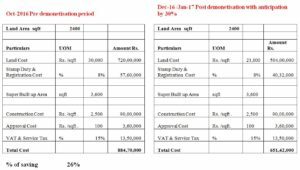 This is because the component of the land cost in the mid income and affordable housing projects is around 10% of the overall price of the unit, fall of even 30% on the land prices, will impact only to the tune of 3% or so and as said ,it is apprehended even this small 3% may get adjusted in the unforeseen incidentals and expenditures. Now let us see what shall be impact on buying a residential plot/ land and building an individual housing on that piece of land. Let us assume, as per anticipation and estimation land price falls by 30% in two to three months period from the pre demonetization times (or little longer).Let us see how it will impact the various segments and individuals (i.e . Upper, middle, affordable or low) who chooses to build an independent house instead of going in for an apartment, price of which is subjected to various vagaries and exposure to developers. Assumed that the individual from this segment buys a 2400 sqft land and builds 3600 sqft of building. Assumed that the individual from this segment buys a 1500 sqft land and builds 1500 sqft of building. Assumed that the individual from this segment buys a 600 sqft land and builds 1000 sqft of building. 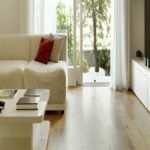 Now coming back to the example of purchase of an apartment by an individual from affordable housing segment and chooses to buy a flat at Rs 3000 per square feet plus stamp duty & registration fees- which vary from state to state and approximately comes to 8 % to 10% of the unit price ) the total cost of the unit comes to around 3250/per square feet to Rs 3300/per square feet. Margin for the Developer Rs 150/. How to improve the situation and bring down the affordable housing price and thus making price affordable for common man. This is quite possible but How ? 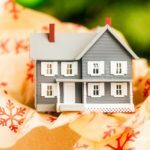 If we are able to contain the approval cost to Rs 50/ cumulatively with the anticipated fall in land price it may have better effect on the price the homebuyer will be paying. This is possible with transparent digital online approval process taking only minimum time for approval and putting an end to unethical practices. States can be asked to frame by -laws in a transparent manner for every division / region of a city and bring out checklist for approval compliance and the approval process shall be made on-line thus eliminating intermediaries, avoidable unethical payments and expenditure. Stricter penal provisions shall be clamped within a time limit of 10 years for any wrong reporting /compliance. In other words project approvals shall be made online on Real time basis without loss of time cutting avoidable overrun finance costs ,unethical payments – which benefit can well be passed on to the home buyer in terms of the price he pays. Digital approval clearance on line at the State Government level is quite possible when there is call from the Government to the common man to move to digital atmosphere for his day to day requirements . This way saving can be in the order of Rs 150/ per square feet. It will be appreciated that providing infrastructure like road water and sewerage is the obligation of the state and may have to be met of the Cess and tax collected from the project. It is estimated that on an average a home buyer can save (by paying a less price) say for electricity Rs 60 per square feet and for water and sewerage Rs 70 to 90 / per square feet thus totaling to Rs 140 to Rs 150 per square feet for housing unit price of Rs 3000/sq ft..
Fund constrained Governments can examine some mechanism with private developers for initial outlay of funds in this arena. This way price reduction can be expected in the order of additional Rs 140-150 per square feet. Point 3 : Rationalization of Tax and fees. In a housing purchase , approximately 20% -25% of the unit price goes to Government by way of taxes and fees In other words , going by our example it is nearly Rs 550 per square feet- some time even it is Rs 700 per square feet with higher registration fees. There is scope for making a single tax for purchase of housing unit and thus reducing the overall price for the homebuyer by another Rs 250 / per square feet This is after leaving the margin for Government to bear the obligatory infra ,water and sewerage costs narrated as above. Thus, if we add up Point 1 to 3 plus anticipated fall in land prices (and the benefit thereof being passed on the affordable home buyer) there is scope for bringing down the home price for affordable housing by Rs 500 to Rs 600/ per square feet, which is substantial. 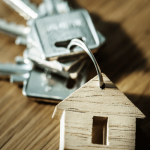 This way and with renewed rejuvenation of the Government’s present move, both affordable housing supply and demand will go up. 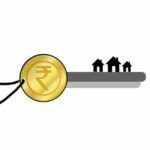 If we are to realize the noble dream and mission of Housing for ALL by 2022, the Governments both at centre and state may have to accord serious thought to the above issues, with primary focus and importance on providing infrastructure like connectivity, water and sewerage for affordable housing projects, which, as said is the prime responsibility of the State. Last but not the least, by and large, the organized segment of Indian Real estate sector wants to be as much transparent and fair .But this possible and in all fairness ,only if systems and procedures at Government level is also made transparent eliminating the scope to be unethical at both the sides. Overall the present measure by the Government is a welcome morale booster for the entire nation & economy and in particular to real estate sector which will surely witness a healthy growth with growing demand with organized, reputed ,credible players on the ground in the days ahead.